Austerity, like beauty, lies in the eye of the beholder. Politicians and emoting celebrities assure us that we are living in a time of vicious austerity. The Poverty and Exclusion website of the Economic and Social Research Council declares that ‘we are paralysed by what is probably the biggest single issue affecting ordinary people in the country: austerity’. What we see as austerity today is a far cry from the austerity of earlier years. Immediately after WWII, Britain, having emptied the Treasury for the war effort, was in even worse financial straits than today. In the midst of this the infrastructure of a devastated nation was rebuilt and a Welfare State created. Such was the depth of post-war austerity that in the years immediately after the war more than 2million people were driven to emigrate from the United Kingdom in search of a better life. The scale of population loss was so great that Winston Churchill feared it would hamper post-war recovery. There was a genuine housing crisis with the need to replace approximately two million homes destroyed by bombing. Newly married couples were delighted to get a tiny prefab enabling them to move out of their parents’ homes. After all, prefabs had inside toilets, a luxury for many. 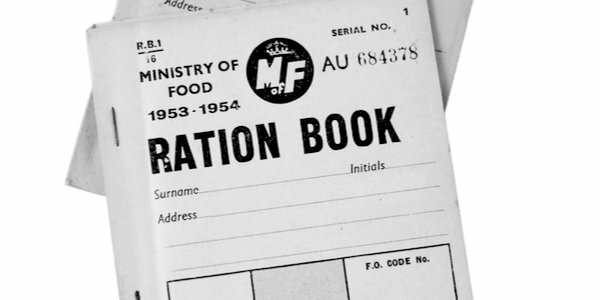 Rationing started in February 1940 and continued after the end of the war. When the Queen came to the throne in 1952, sugar, butter, cheese, margarine, cooking fat, bacon, meat and tea were all still rationed. Rationing did not actually finish until 1954, with sugar rationing ending in 1953 and meat rationing in 1954. Food was seasonal – no tomatoes or strawberries in winter – there were no supermarkets, no frozen food or freezers to store it in and the only takeaway was fish and chips. Instead there were spam fritters, fish paste sandwiches and tinned fruit with evaporated milk. You could add flavour with dollops of tomato ketchup or brown sauce. Food during and immediately after the war was about sustainability, minimising waste and nutrition. Boring, undoubtedly, but as a result of the austere but nutritionally-balanced diet deaths from disease and other natural causes were reduced and children’s health improved. The winter of 1947 was exceptionally harsh, with deep snow and sub-zero temperatures for weeks on end. Between January and March, snow fell every day somewhere in the country for 55 consecutive days. Thousands of people were cut off. Supplies had to be flown in by helicopter to many villages, and the armed forces were called in to help clear roads and railways. Farm animals froze or starved to death, vegetables could not be dug up and there was a severe fuel shortage. The recent ‘Beast from the East’ with its ‘Red Alerts’ which dominated the headlines was a mere chilly snap. There are undoubtedly casualties in society today due to our economic circumstances. We find the NHS nearing breaking point, local government cutting services and food banks proliferating. There are people who are suffering. The solution put forward for dealing with this by the Labour Party, Lib Dems etc has the advantage of being simple and easy to understand: throw money at it. Despite the evidence of the recent past the government is urged to borrow yet more and give it away to those in need. This has a threefold advantage for the Opposition: it demonises the heartless Tories, it buys votes with taxpayers’ money, and it pushes the problem down the road for a few years, and the next election is as far ahead as many politicians think. The response from the Conservatives is only slightly better. They advocate continuing the present economic policies with the promise that somehow we will gradually emerge from austerity. The alternative is too difficult to contemplate: rethink our present welfare system. The NHS is about the nearest thing most in Britain have to an established religion and any mention of altering its basis of being free at the point of use is met with howls of ‘heresy’ from true believers. But it has to be faced: it is only a matter of time before the NHS grinds to a halt. A welfare system which creates welfare dependency does more harm to the poor than good. What was envisaged to be a safety net for the few in desperate circumstances has become a comfort blanket and surrogate parent for many. Invest in Britain. Importing cheap labour from overseas is expensive in the long run. Hidden away in the depth of their propaganda dossier for staying in the EU, the Cameron government revealed that unemployed EU migrants received £886million in housing benefit, jobseeker’s allowance and sickness pay in 2013-14. If that money were used for vocational training for youngsters already resident in the UK there would be significant economic and social advantages to the country. The biggest difference between post-war austerity and today’s austerity, however, is seen not by comparing relative economic and social circumstances but by comparing the attitudes and character of the people involved. Immediately post-war, the UK was still a relatively cohesive society with a shared set of underlying Christian beliefs and attitudes. Today is different. Next articleKaren Harradine – The new Apartheid – with white farmers the victims.